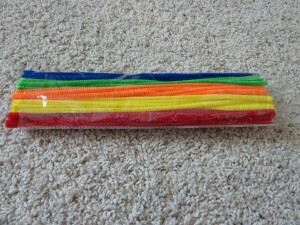 I like to use pipe cleaners when starting to build a skill like this because they are sturdy and are less frustrating than wiggly laces or string (there is time for that – remember we are just beginning this skill!). 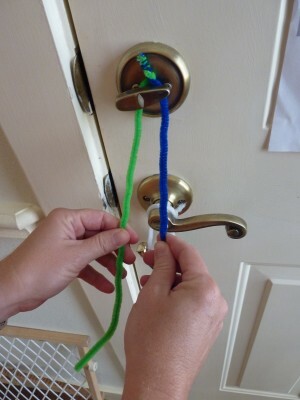 and then found a door with a lock so I could loop the pipe cleaner around it. 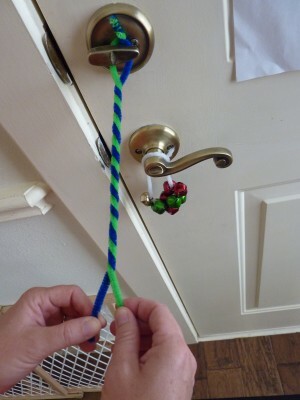 I looped it around a door lock that would be a good height for him. 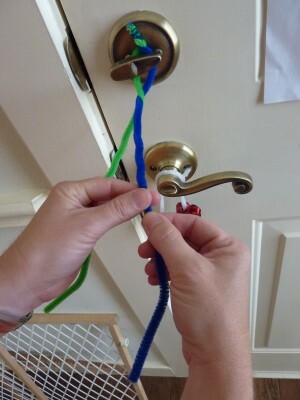 Crossing the pipe cleaner to make an "x" before twisting it under. 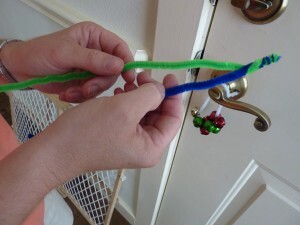 Twisting the green pipe cleaner under the blue one and switching hands. Continue this process until they reach the end. This could also be done around their foot :), which may work even better to prepare him for shoe tying! Will have to try that since I just thought of it as I am writing this. The object of this is to take a pipe cleaner in each of his hands and twist it around, switching pipe cleaners and hands after each twist. 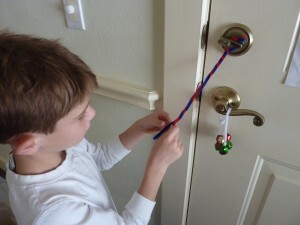 They will continue this, creating a candy cane like effect by twisting them together. 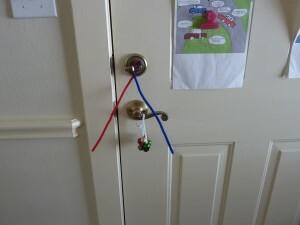 After doing stuff like this with your child you will begin to see patterns that show up in multiple different areas. An example of this for us is that Andrew’s right arms and hands seem to dominate much more than his left. When I would watch him run, his left arm would move a little but not nearly as much as his right arm. When he swims, he tends to run into the side of the pool on his right because his left arm doesn’t reach out and push through the water like his right arm. We have worked on this and as he has developed and gotten older, it has improved a good deal. 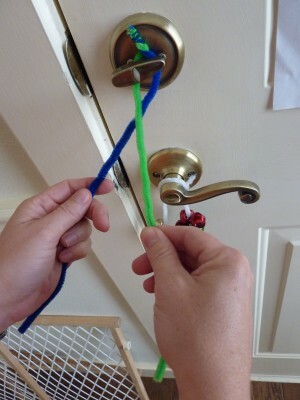 With this particular activity, I noticed that he would use his right hand to twist the pipe cleaner around the one in this left hand, which was basically just there holding the other pipe cleaner. It is always interesting for me to notice things like this so I can provide him with more activities to work on this and also take note to mention it to his therapists. I look forward to sharing whatever activities I come up with or find to help build this skill.